Join us for an evening celebrating 12-time Grammy Award winning producer, arranger and composer, Arif Mardin. We will be screening the Grammy nominated film, "The Greatest Ears In Town: The Arif Mardin Story", which chronicles the life and career of the man who produced more than 50 gold and platinum records with sales topping 50 million units. 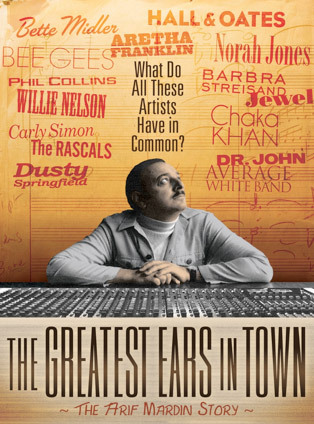 Filled with rare footage, photos, and packed with incredible music, "The Greatest Ears In Town" features in-depth and intimate interviews and/or studio footage with music luminaries, friends and artists including Quincy Jones, Ahmet Ertegun, Sir George Martin, Willie Nelson, Carly Simon, Jewel, Daryl Hall, Phil Collins, The Bee Gees, Norah Jones and many others. "The Greatest Ears In Town" is one of the most insightful, enjoyable documentaries ever made about how hits are created. Following the screening there will be a Q&A with Joe Mardin and Doug Biro, co-directors of the film and a live performance by Raul Midon, who was produced by both Arif and Joe Mardin. The evening's proceeds will go toward supporting ATS educational programs.